Poet and author Maya Angelou died Wednesday, May 28, in her home in Winston-Salem, North Carolina. Angelou is considered one of the finest poets of her generation. 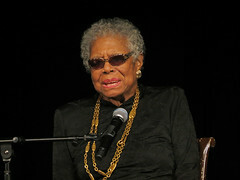 In addition, she authored several books chronicling her youth and adolescence, including I Know Why the Caged Bird Sings. Find related web resources and lesson plans on Angelou on the ReadWriteThink calendar entry for her birthday. For excerpts from an interview with Angelou, consider sharing ‘Fresh Air’ Remembers Poet And Memoirist Maya Angelou with students. Read biographical information about Angelou and write an Acrostic Poem with the interactive tool or with the mobile app. Use the BioCube interactive to record information about Angelou’s life. Work with text from Angelou’s writing or poetry to compose found poems with the Word Mover interactive or mobile app. Create a Timeline of significant events in Angelou’s life with the interactive or mobile app. August is a hopping month on ReadWriteThink. With teachers getting ready to head back to the classroom, the calendar is jam-packed with resources to help make the first days full of fun learning. You can find back-to-school booklists, icebreaker activities, and community-building resources on our back to school calendar entry. In the featured classroom activity, students share details about their lives with one another using the interactive Graphic Map and share their memories in small groups or with the whole class. If you’re looking for STEM activities, it’s a good time to talk about computers and the prototype for the World Wide Web, which was created in August 1990. Budding astronauts can explore the first satellite picture of Earth, taken in 1959. This week’s featured birthdays focus on President Barack Obama (August 4), French author Guy de Maupassant (August 5), science writer Seymour Simon (August 9), and writer Alex Haley (August 11). In sports history, the first woman swam the English Channel (August 6). This week also marks the anniversary of our national museum. The Smithsonian Institution was founded August 10, 1846. Today, it has expanded to a network of 16 museums and 129 affiliate museums—including the National Zoo and the National Air and Space Museum. Celebrate by exploring an exhibit online and writing “A Day in the Life” narratives that tell about a person, animal, or object they saw in the exhibit. The materials range from mini-lessons to complete units and cross the grade levels. So read on, and celebrate Dr. Martin Luther King, Jr. and his work. Focused on Martin Luther King, Jr. In 1929, Martin Luther King, Jr. was born on this day. Students study Martin Luther King Jr.’s “I Have a Dream” speech and work in groups to create a mural that depicts Dr. King’s vision of peace. Students explore the ways that powerful and passionate words communicate the concepts of freedom, justice, discrimination, and the American Dream in Martin Luther King, Jr.’s “I Have a Dream” speech. Nikki Giovanni’s poem “The Funeral of Martin Luther King, Jr.” is paired with Dr. King’s “I Have a Dream” speech, taking students on a quest through time to the Civil Rights movement. Dr. Martin Luther King, Jr. delivered his “I Have a Dream” speech in 1963. Students explore the “I Have a Dream” Foundation’s website and brainstorm ways they can help themselves or others at their school achieve their educational dreams. This lesson provides ideas for celebrating Martin Luther King, Jr. Day by encouraging students to explore the connections between Dr. King and themselves through journaling and inquiry-based research. This lesson provides the “action piece” for any study of Dr. Martin Luther King, Jr. In this project, students participate in Dr. King’s dream by doing 100 acts of kindness. Inspired by the book Martin’s Big Words, students explore information on Dr. King to think about his “big” words, then they write about their own “big” words and dreams. Students will identify how Martin Luther King Jr.’s dream of nonviolent conflict-resolution is reinterpreted in modern texts. Homework is differentiated to prompt discussion on how nonviolence is portrayed through characterization and conflict. Students will be formally assessed on a thesis essay that addresses the Six Kingian Principles of Nonviolence. Middle-level students learn the ins and outs of writing biographies by researching a contemporary or historical figure and writing a summary. Secondary students read biographies and explore websites of selected American authors and then role-play as the authors. Adapt this lesson to ask students to consider Dr. King, as the author of the “Letter from Birmingham Jail,” “I Have a Dream” speech, and other texts. Elementary students explore a number of sources to create a biographical timeline about a selected person. Students collaboratively research and resolve conflicting information they find during their investigation. 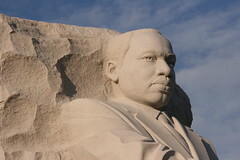 Have students write acrostic poems about Dr. King or events from his life with the Acrostic Poem tool. Students use the faces and places they learn about in their research to write a biography about a contemporary or historical figure. After reading about historical figures and other important people that have changed the world, children choose someone that they consider to be “amazing”—either someone they’ve heard about or someone they know—and create a book page that highlights this person. Podcaster Emily Manning shares books that serve as a springboard to discuss how children and adults alike can use peaceful, nonviolent methods to affect change in society. This is episode 21 of Chatting About Books: Recommendations for Young Readers, a Podcast for Grades K–5. Families and children can gather or summarize information about Dr. Martin Luther King, Jr. with the Bio Cube interactive. Use the word bank from Dr. King’s “I Have a Dream” speech and create found poetry. If you want even more resources, check out the Martin Luther King, Jr. collection from Thinkfinity. Making a New Year’s Resolution is easy. Keeping it? That’s a different story altogether. Personal goals end up competing with teaching goals. The busy whirl of heading back to the classroom crowds out all those plans, and the next thing you know, it’s March and those teaching resolutions are long forgotten. How about some help with those goals? I’ve gathered some of the best resources from ReadWriteThink and Thinkfinity to help make sure your good intentions all become accomplishments in 2013! ReadWriteThink’s Strategy Guides cover areas ranging from teaching with technology to reading in the content areas. Want to learn more about content area reading? Register for our Free Webinar: Using Formative Reading Assessment to Enhance Content Area Learning. Watch Doug Buehl’s webinar on Meeting the Demands of the Common Core: Mentoring Readers of Science and Technical Texts on demand. Find even more webinars and additional resources in the Professional Development area of the Thinkfinity site. Collaborate more with other teachers: You can share ideas, give other teachers some advice or feedback, and ask questions about your classroom and students on the Thinkfinity site. Visit the Community Hub, The Lounge, or the Online Tools for Educators to connect with teachers across the U.S.
Use Parent and Afterschool Resources from ReadWriteThink to give families everything they need to try activities outside the classroom. Point families to the Wonderopolis site for a daily activity that take advantage of the kinds of questions kids ask every day. Share the ReadWriteThink podcasts Chatting About Books: Recommendations for Young Readers and Text Messages: Recommendations for Adolescent Readers to give families book recommendations on a wide range of topics. Publish your ideas: Want to share your teaching strategies with teachers everywhere? ReadWriteThink welcomes contributions from educators who want to write or review for the site. Fill out our online interest form and you’ll be on your way to publishing a lesson plan, a classroom printout, or a strategy guide on the site! Whatever your goals, I hope you meet them and have a fantastic 2013. It’s the gift-giving time of year, and if you’re giving someone an iPad, you can start getting it ready with these great apps for children, teens, and teachers. Take poetry on the road with this ReadWriteThink app. 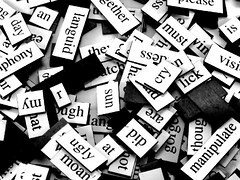 Kids and teens can create “found poetry” by choosing from word banks and existing famous works like “America the Beautiful” and Dr. Martin Luther King’s “I Have a Dream.” Kids can pull up a famous work or the word bank, find words that inspire them, and arrange them into an original poem! With this ReadWriteThink app, kids and teens can create trading cards for fictional people and places, real people and places, objects, and Events. Imagine the fun of having kids create trading cards for favorite holiday characters and places. How about making trading cards as place cards for a holiday dinner—one card for each family member! Going on a family trip? Make a card for each place you stop. The possibilities are endless! Mission US, Think Fast! About the Past from EDSITEment challenges kids to test their knowledge of history as they race against the clock. EconEdLink has gathered a collection of apps on economics and personal finance for mobile devices. Illuminations has created a range of Mathematics Apps including the games Math Concentration, Deep Sea Duel, and Okta’s Rescue. Science NetLinks reviews STEM-related apps for both the iPad and the Android. Nat Geo Mobile offers apps, games, mobile video, and more. Everything for a geography explorer could ever want. If you’re working with teens, also look at The Verizon Innovative App Challenge, which provides the opportunity for middle school and high school students, working with a faculty advisor, to use their STEM knowledge, their ingenuity, and their creativity to come up with an original mobile app concept that incorporates STEM and addresses a need or problem in their school or community. No matter what holiday you are celebrating this month, nothing is quite as precious as a handmade card—especially when it comes from a family member or friend. We’ve collected some easy ways that you can help the students you teach make cards in class as well as instructions that you can send home for families to use together during the Winter holidays. The resources do not refer to any particular holiday, so they work whether students and their families want to make cards for Hanukkah, Yule, Christmas, or Kwanzaa. The materials can even be used to celebrate the first snowfall or wish someone a Happy New Year. And, of course, the same instructions work for Thank You cards too. So read on, and get ready to make some fun greeting cards! Make a simple card: Make a funny or thoughtful greeting card with photos of family or friends and a poem, joke, or riddle. Find simple step-by-step instructions on how to Send a Smile! For a full lesson plan for early elementary students, check out Using Greeting Cards to Motivate Students and Enhance Literacy Skills. Draw a cartoon: Use the Comic Creator to make a one-of-a-kind greeting card. Kids and teens can illustrate scenes that show how they celebrate with family and friends or create scenes that show what would happen if a dinosaur showed up to celebrate at their home. 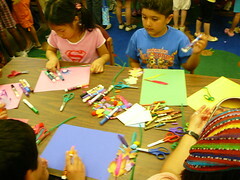 Write a poem: Help a Child Write a Poem for the inside of a card, or frame it for a special piece of art. Use one of our online tools to write an Acrostic Poem, a Diamante Poem, or a Theme Poem. Create a folded card: Use the Stapleless Book to make an 8-page card for a special family member or friend—and it all fits on one sheet of paper! Design a postcard: Write a postcard with the Postcard Creator then print it out and illustrate the front in a variety of ways, like drawing a picture, creating a collage of images, or printing and pasting clipart in place. Publish a greeting: Make a nontraditional greeting card with the Book Cover Creator. Kids and teens can imagine what a book about a Winter day with their family would be like and create front and back cover as a greeting card. Compose a year-end letter: Help a child or teen write a letter to friends and family that sums up all the things they have done in 2012 with the Letter Generator. Whatever you do, hope you have a fantastic December. Leave us a note in the comments on how you spent your time together! 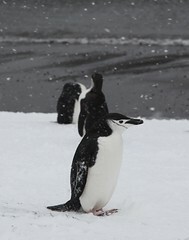 Choose an animal you think about during the winter (like penguins, polar bears, or snowshoe rabbit), and explore its habits and life cycle with the Animal Inquiry interactive. Use the Resume Generator to create a resume for a character from a favorite story or song. What would Scrooge list on his resume? Compose Shape Poems with the bus for the last day of school. Students can talk about all the things they hope to do during the winter break—after they ride home on the school bus for the last time in 2011. Have students map significant personal events they remember from previous winter holidays with the Graphic Map. 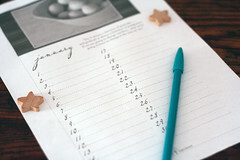 Write a class alphabet book of activities to try during the winter holidays with the Alphabet Organizer. Ask students to think of a favorite event that happens during the winter break, and compose Acrostic Poems about it. Create Character Trading Cards for characters from winter-themed or holiday-themed books or songs. Imagine a trading card for the Baby New Year! Reflect on all that has happened since the start of the school year in a class newspaper, created with the ReadWriteThink Printing Press. Explore school days and winter vacation in a Diamante Poem that unites the two opposing topics. Use the Profile Publisher to mock up social networking profiles, yearbook profiles, or newspaper or magazine profiles for characters from winter-themed or holiday-themed books or songs. What would Frosty the Snowman list on his Facebook profile? This list also posted in the Reading & Language Arts Group in the Thinkfinity Community. How do you define “teacher quality”? Today I’ve read two articles that make me curious about the way “teacher quality” is being defined and measured these days. First, I read a New York Times article about a school in Tennessee where the principal is so busy with paperwork and unnecessary observations that he’s lost touch with many of the things happening in the school. The title of the article neatly summarizes their feeling for the way that Race to the Top has led to a redefinition of “teacher quality” at their school: In Tennessee, Following the Rules for Evaluations Off a Cliff. Maybe it can be partially attributed to the language that’s used, but the Edutopia blog seems to posit “teacher quality” as something that you nurture and encourage while the the Times article seems to describe a scenario where “teacher quality” is something you have to badger people into developing or revealing. I understand the desire and need for ways to measure “teacher quality.” I’m just not sure of the right way to go about it. How do you think “teacher quality” should be defined? I’d love to hear some real teachers talking about the issue. Cross-posted as a Discussion Question in the Verizon Thinkfinity 101 Community on the Thinkfinity Community site. Interactive whiteboard redefine hands-on activity in the classroom, as students manipulate information on a giant digital display. They also bring teachers a new challenge: what activities can you use to make the most of this new technology? Teachers on the Thinkfinity Community have been busy collecting answers. Theresa Gibbon suggests trying ReadWriteThink’s interactive Word Mover for “I Have a Dream” and Word Mover for Holes and asking students to rearrange the words on the whiteboard as a class experience. Find dozens of additional ideas on the Thinkfinity Community discussion board. This post is the introduction from “August 10 to 16 on ReadWriteThink.” Read the rest of the post in the Thinkfinity Community site.